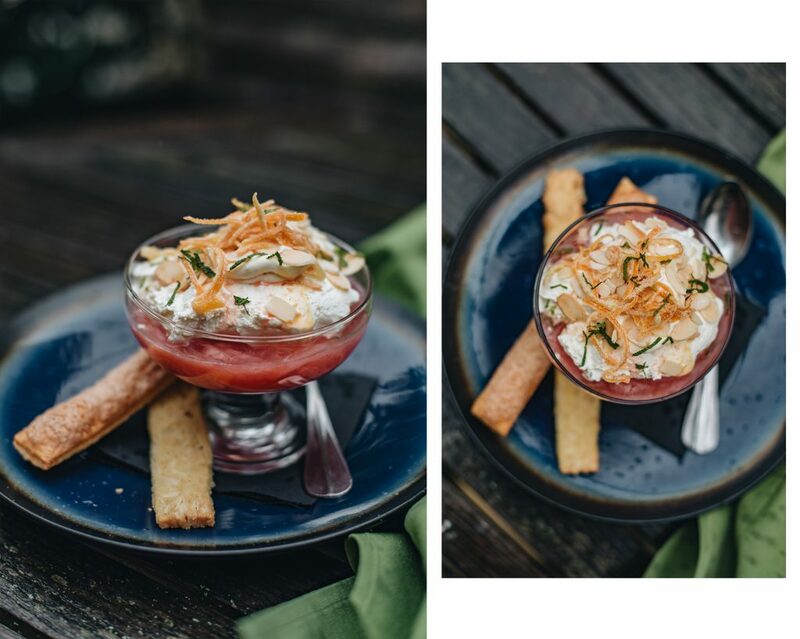 No dessert could beat the winter blues as perfect as Traditional English Fool. Rhubarb variety of it is probably the best way to brighten up the dull February days and to get some well needed this time of year vitamin “C” into the system. Zest and juice of an orange. For the rhubarb compote, put all the ingredients into a non reactive (stainless steel) pan and bring to a simmer. 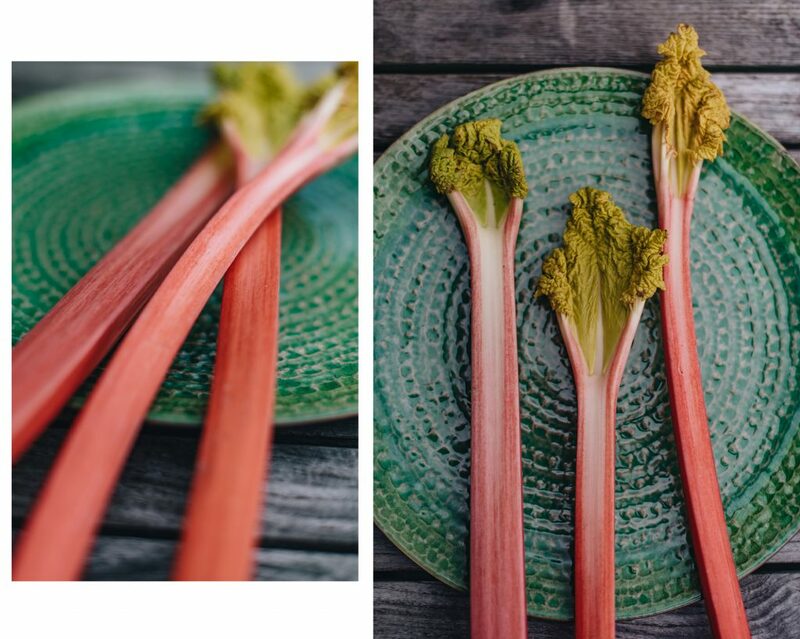 Cook until the rhubarb is falling but not lost it’s shape and texture entirely. Taste and add more sugar or a squeeze of lemon juice accordingly. You want the compote to be quite sharp to counterbalance the cream. Leave to cool then take out the star anise. n.b We take a little of the surplus cooking liquid and reduce it down to make a syrup which can be poured atop the finished fool. For the cream. Set a metal bowl atop another bowl, the lower bowl 1/4 filled with ice and water. ( This will help to keep the cream light and airy ) whip the cream and vanilla seeds until they are just holding a soft peak. Sift in the sugar and carefully fold in the cream fraiche and Cointreau. n.b in essence this is a chantilly cream. 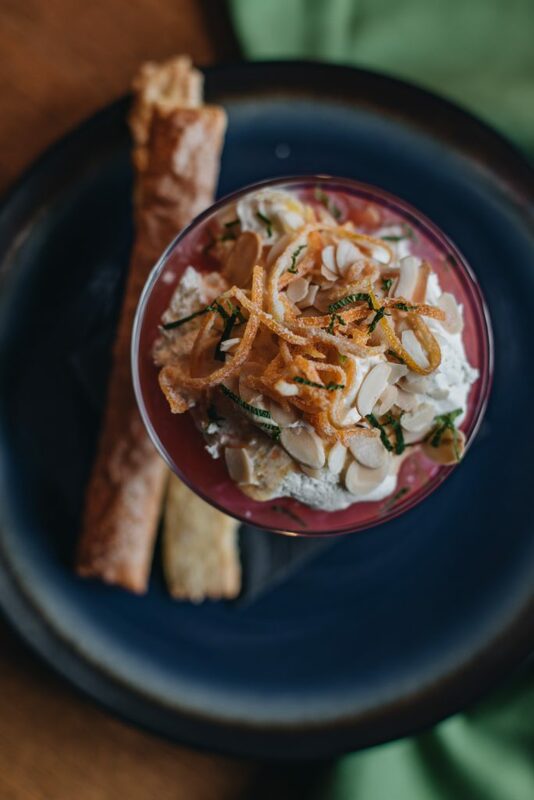 Assemble the fool and top with toasted almond flakes and candied citrus zest.